Home >> Opinion >> Obama and Hillary’s 16 year Plan To Destroy America!!! Posted by: Jim Clayton in Opinion, Trending Commentary February 21, 2018	Comments Off on Obama and Hillary’s 16 year Plan To Destroy America!!! 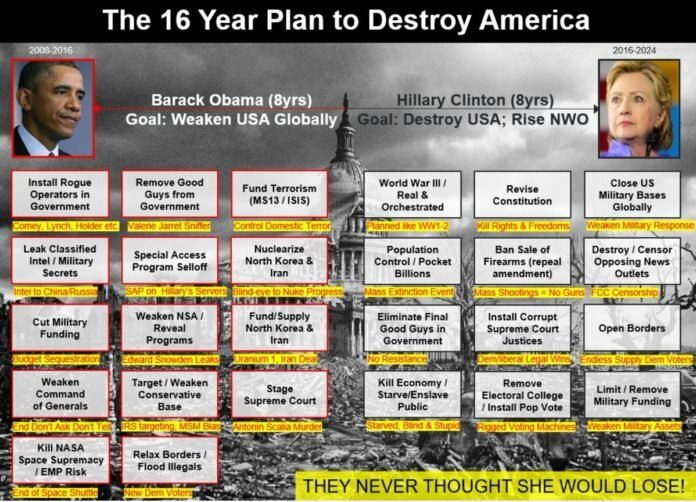 The above chart perfectly outlines the16 year plan by Hillary and Obama to destroy the United States in the name of globalism. Obama has stated that “if we did away with borders it would end terrorism” meaning the whole world be one big country under one rule, the U.N. known as the New World Order. The most frightening thing about the recent Wikileaks drop, which included excerpts of Hillary’s paid Wall St. speeches is her excitement over ending the United States as we know it. Hillary is an extreme globalist. QAnon a mysterious source on the internet who is a loyalist who has close relations to trump and is usually right on target said in an explosive post this past Sunday that Barrack Obama and Hillary Clinton had a 16 year treasonous plan for a coup d’etat in the United States that would end up revising the constitution, canceling the second amendment and opening the borders to flood the nation with illegal immigrants who would vote democratic for the foreseeable future (see diagram above). In his post Q also alleged that deep state rogue operatives murdered supreme court justice Antony Scalia to lock in a hard left ideology on the nation’s highest court to give Obama one final nomination for the court. This is what I have also been saying in previous posts. Hillary and Obama want to revise the constitution. OBama called it “an outdated document” when it is the back bone of our democracy. Q also mentions that the Nunes Memo alerts the American people to the democrat party coup d’etat undertaken by Obama, Hillary, Podesta collusion with Russia. Obama, Hillary, Podesta and many others are guilty of treason. Hillary was right when she said, “If Trump is elected we will all hang.” And they should. The Nunes memo proves also that the Obama administration weaponized the intelligence community to ensure that the Democrats would win in 2016.The weaponizing included using the Fusion GPS dossier that was bought and paid for by Hillary and the DNC to get a FISA approval to conduct electronic surveillance of a Donald Trump campaign worker. They never thought Hillary would lose. The fix was in. America escaped a big bullet. Thank God she lost. 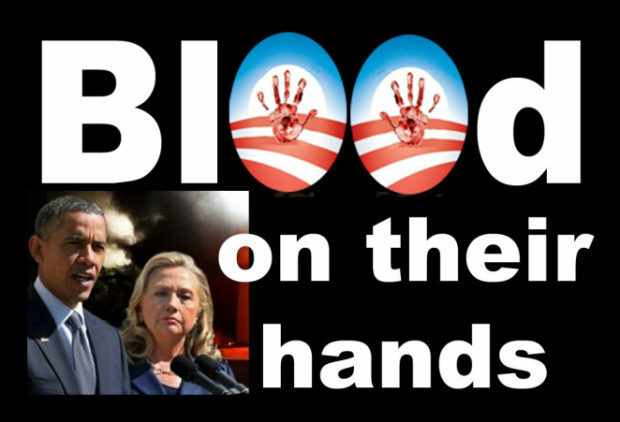 Now a WikiLeaks document reveals that the Obama administration deliberately abandoned American citizens in Benghazi. Reportedly, Hillary Clinton who was the State Secretary at the time wrote an email to John Podesta, one of Obama’s most trusted allies, in which she admitted that she issued a “stand down” order to U.S. troops located 3 miles away from our embassy in Benghazi. The email also revealed that former President Obama knew all about it. It looks like instead of attacking them, Hillary “went to bed with” radical Islamic terrorists who killed Americans on 9/11, 2012. This is an act of treason that Hillary displayed. She chose terrorists ahead of her own troops. Unfortunately, this is not all of it. Allegedly, Hillary also confirmed to Podesta that the stand down was approved by Obama who was the head of the state then. In her messages, she also suggests that Obama left her to make the ultimate decision. Evidently, he told her to do “whatever she thought was best” in order to secure the weapon deals Former Libyan Prime Minister Muammar Gaddafi and prevent them from being handed over to the Germans. The incompetence of the Obama administration to deal with the Islamic extremists led to the deaths of four brave Americans.